EARN’s Big Data on Small Savings research unearths rich insights into the financial lives of low-income households. This series provides data-driven perspectives on what works in helping individuals develop financial security. Sign up for EARN’s research newsletter to receive updates, reports, and information about upcoming webinars. To access the recording for our April 3 webinar: "Surviving the Shutdown: How Financial Technology Supports Americans' Resilience", click here. The shutdown this year rocked the lives of millions of Americans, particularly those receiving direct support from the government. Erica’s financial world was rocked by the government shutdown. Learn how having a savings cushion helped her. Do prizes motivate people to save more? The results of EARN’s first foray into prize-linked saving are promising. EARN shares how we leveraged the CFSI Financial Health Score® Toolkit to measure the financial health of Savers. The financial health scores of Savers gives EARN insights into aspects of their financial lives beyond savings. Here is what we learned. Does making a promise to yourself lead to more savings? We tested nudges and prizes aimed at getting families to save their refunds. In this webinar, we looked into how definitions of saving impact people’s finances during tax-time and the following months. What we learned about how saving and spending habits changed after receiving a tax refund. Tax season has long been viewed as a golden opportunity for low- and moderate-income families to build a savings cushion. But do people really save their refunds? EARN wanted to understand if the account types Savers choose correspond to success in SaverLife. The results are clear. EARN looked at the incomes of 20,000 Savers and found monthly fluctuations to be not only frequent, but also large. But there are reasons for optimism. In this webinar, we explored the effects of income volatility on the savings of over 10,000 EARN clients and discussed potential solutions. To learn more about the real experience of income and expense volatility among low-income households, EARN analyzed more than 700,000 financial transactions from 10,938 SaverLife Savers to examine volatility trends on both savings and checking accounts. Over the past year, EARN reached out to many families to find out what more we could do to support their savings. Their answers surprised and inspired us. EARN’s online SaverLife community empowers low-income households to take control of their financial lives. Members are representative of a broad swath of Americans who struggle to save and are striving to develop financial security. 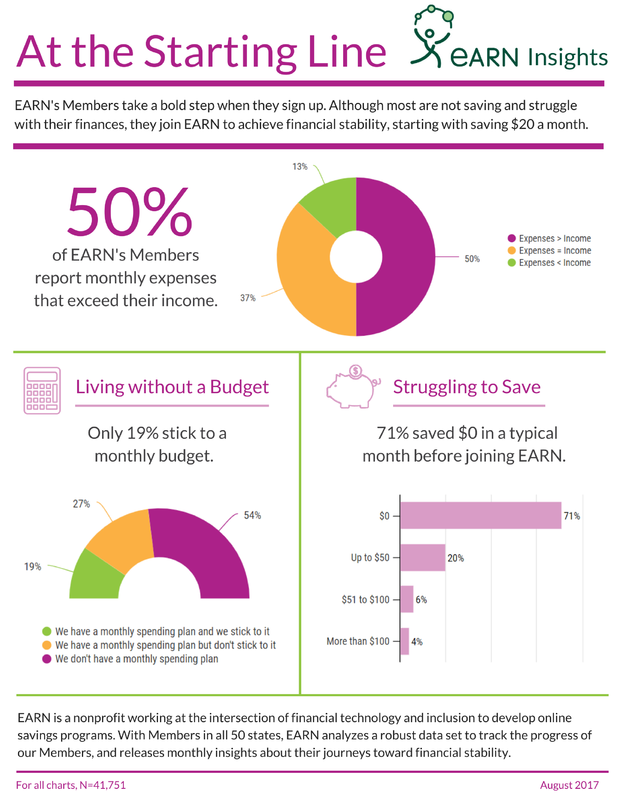 A vast majority of EARN's Members regularly experience months when their income does not cover regular expenses. 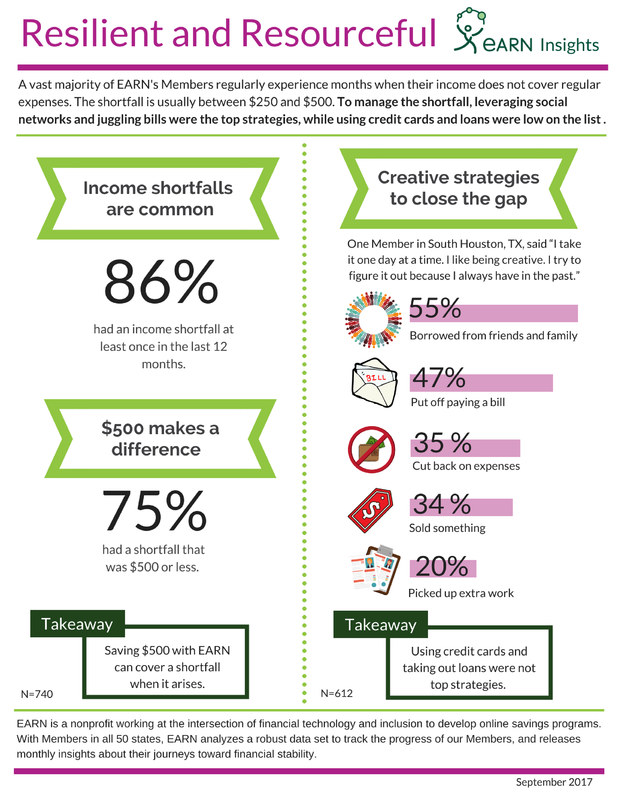 To manage the shortfall, leveraging social networks and juggling bills were top strategies, while using credit cards and loans were low on the list. EARN's Members take a bold step when they sign up. Although most are not saving and struggle with their finances, they join EARN to achieve financial stability, starting with saving $20 a month. EARN's online savings programs help lower-income individuals and families across the country save. 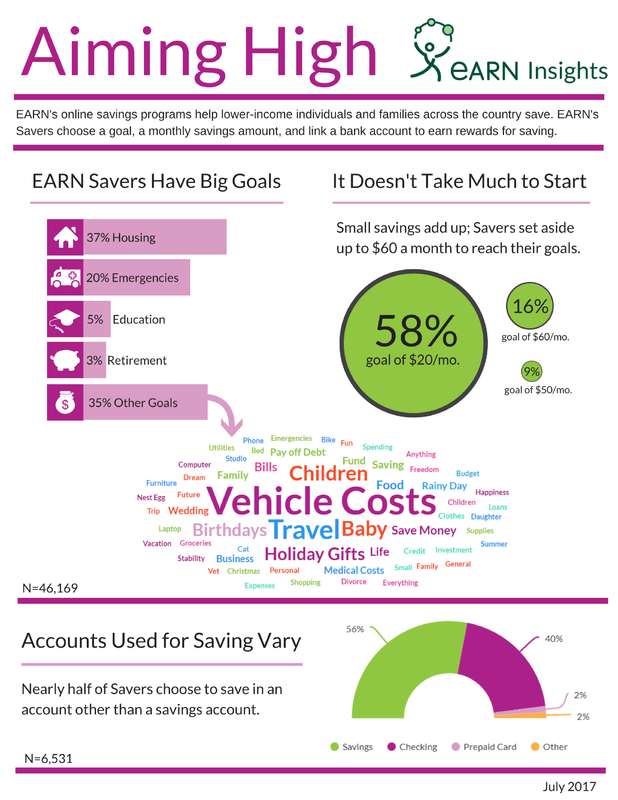 EARN's Savers choose a goal, a monthly savings account, and link a bank account to earn rewards for saving. SaverLife’s direct connection with low-income households generates millions of financial, economic, demographic, psychosocial, and transactional data points. Members complete a detailed intake questionnaire upon joining the SaverLife community and have the opportunity to link their personal bank account to the SaverLife platform. A unique combination of real-time transactional data, statistically significant surveys, and qualitative research consisting of interviews and focus groups, enables EARN to unearth rich, original insights. EARN is committed to the privacy and protection of our members. All data collection is anonymized and secured using best-in-class security protocols. You can also read more of our research, explore our public policy work, and learn how EARN impacts our Savers' lives.